It's time for the 3rd instalment of our popular series peeking into the handbags of people who are aiming to live life more kindly, and this time we're going to discover what a globally-minded PhD student carries in her daily bag. Zahra Khosroshahi describes herself as a person born in Tehran & raised in Toronto with a heart that floats between the two. While she's working on a PhD exploring the representation of women in Iranian Cinema at the University of East Anglia, she also finds time to blog at her family's online natural & sustainable product store. She has a passion for environmental & health issues, pursues a zero-waste lifestyle as closely as she can, and is a fellow vegan. Zahra's Instagram account documents her clever planning so she can minimise waste in her student life. But of course, we're curious to know what on earth she carries in her handbag to make this possible, so let's have a peak into her bag now. I am a PhD student living in the UK and like anything else, I want my handbag to reflect my values, lifestyle and of course my sense of style. Matt & Nat combines all these factors into a backpack that is practical and comfortable, 100% vegan, ethical and absolutely chic. This bag takes me from seminars and conferences to dinners and cafés. As a zerowaster, I try my best to avoid any packaging, especially plastic. I’m often on the go or shopping around in markets and this means I have to be prepared and ready with my kit. In my bag, at all times, I will carry everything I need for eating out and any spontaneous food shopping that comes my way. Buying a plastic water bottle really breaks my heart. It’s unsafe, unhealthy, wasteful and expensive – and SO easy to avoid. I carry my own utensils so that I can avoid plastic forks and knives, and disposable chopsticks. I’ve also stuck my own stainless steel straw in there so I don’t every use plastic straws! There’s no need for disposables. I think it’s much better to invest in a few reusable items that can be washed and reused again and again, rather than items with one-time use that get thrown away, wasting resources and hurting our planet. All it takes is a bit of planning. I’m one of those people who has to write it down. I like to keep things old school sometimes. I carry my dairy and a pen with me all the time – and this way when an idea hits I have something to write on as well. I have a simple Marimekko pouch I picked up when I was in Finland that I use for my wallet. It’s made from stainless steel and cotton canvas and has lasted for over two years now! But I do have a Matt & Nat wallet on my Christmas wish list. I have a goal of reading one book a month that isn’t related to my research. Since I travel quite a bit on public transport and trains, and spend a lot of my time in cafes, my book always makes its way into my bag. I live in the UK. Enough said. Ever since going vegan and zerowaste, my makeup routine has become more minimal. That said, I always carry my Radiant Shimmer kit by Pacifica, which has three shades that can be used as highlighter, bronzer, eye shadow and even lipstick. And of course these guys are 100% vegan and cruelty-free, working super hard to reduce their impact on the environment too. 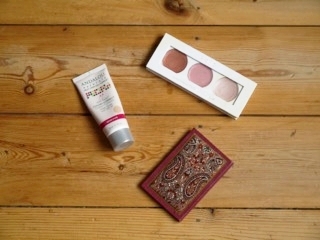 Thank you for sharing what you carry in your ethical bag Zahra. a big difference to reducing waste in simple daily living. rather than relying on disposable paper ones. or read her thoughtful blog entries at Living Life Natural. that we can all use to make our world a kinder one. We recently interviewed Katie Pruett about her magazine Ethical Style Journal, which celebrates ethical and sustainable fashion, and inspires readers to shop more consciously. Today, we're taking a peak into this femtrepreneur and vegan mom's handbag. What does a fourth generation vegetarian, vegan mum and compassionate fashion store owner carry in her handbag? Find out in our chat with Jannifer Black of THE V SPOT. In this instalment of our 'What's In My Ethical Handbag' series, we're chatting with a vegan ballerina and social influencer from Los Angeles: Agnes Muljadi aka @artsyagnes. If you were a student wanting to practice a zero-waste lifestyle, what would you carry in your handbag to make that easier? We asked PhD student Zahra Khosroshahi what she carries in her ethical bag, and learnt a few clever tricks ourselves.